Wiltshires Kevin Miller won the Stratford Club OK Supreme trail bike trial on Saturday with a faultless feet up ride plus one of the fastest special test times of the day on his Sherco X Ride. Held around a single 70 mile lap of the Cotswold Hills near Broadway, it was the steep muddy gully of the timed Special Test at Sadlers that was to be the decider on the day. Miller stood out as one of only three riders to crack the 40 second barrier here. 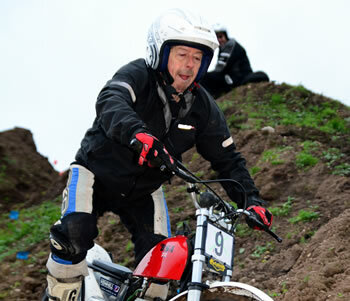 The fastest time of the day actually went to Marc Gibson on his rocket ship KTM 525 who lost marks on observation. Club committee member Carl Blakely also had a clean sheet riding a borrowed Beta Alp but the little 200 just didn’t have the power to match the bigger bikes at the timed test, so Blakely took runner up with Christian Pearson coming home third on his CCM 230. In the Over 350cc class, Russell Fisher took top spot on his 450 KTM on just two marks lost from event organiser Pete Barnett also on two marks who crashed into the mud at the special test failing to record a time. Sam VanBueren was in with a chance on his 650 Honda, but the final graded hill climb caught him out for three marks demoting him to third place. Simon Shadbolt was first Twin Shock on five marks lost with a special mention to Christopher Shawcross for completing the course on his 38 year old Suzuki 185 for a loss of just 12. The change in format of the OK Supreme event seemed to be a success, less sections and more trail riding saw numerous riders enter their first trial and the appearance of a wide selection of varied and interesting bikes including a KTM Supermoto with cut slicks and an ex MOD Armstrong MT350 complete with camouflage paint. The Coffee and Cakes served at Broadway Tower Country Park at the eleven o’clock tea break also went down very well indeed. A special thanks to the many landowners who helps the club make this event possible.